"War is not just a game where you slaughter your enemies. It's a struggle to remain human despite carrying a gun in your hand." The first time I heard this song, it was because I was interested in seeing this drama, but I was put off by how cheesy I found it, and for one reason or another, I've put off watching this drama. When I finished this drama earlier this afternoon, and the theme began to play, I began to sing along, my voice shaky and weak, and my face tear-stained and snotty. This drama is just that powerful. First off: I am no scholar on the Korean War. In fact, far from it. So if you want anything pertaining to historical accuracy, down to the uniforms and guns... look elsewhere. Note: Contains slight spoilers for most of the drama except for the ending. If there's one thing that I gleaned from this drama, it's that it changed my view on war pretty drastically. I grew up watching a lot of war films, and one in particular has stuck with me like glue. It's Gettysburg (1993), and although not particularly realistic in the gore area, I have always found it moving with its presentation of ideologies and its fair treatment of men from both the North and South sides of the American Civil War. As a result of hero-based war movies, and other non-fictional and fictional literature I've read over the years, though, I think I developed a starry-eyed view of war, with its practically worshipped war heroes such as Robert E. Lee or George Washington. Of course, war had different rules in the 1860s than the 1950s, and was a tad more gentlemanly, if you will (though only in terms of tactics), but the longer I've studied, the more I've come to terms with how horrible war was and is. However, even if I have learned how horrible war was and is, I always accepted it as a necessary evil. As in, if people can't solve their problems in any other way, then war is the only option left. Right? But for some reason, Comrades has changed that thinking. Going to war isn't necessary. It's an action that people have come to think as normal, which it shouldn't be. People shouldn't have to suffer being POWs. People shouldn't have to hate and fear each other. 17-year-old boys, who could easily be friends, should not have to fight and kill each other. There shouldn't be a firing squad waiting behind their own lines in order to shoot their own men who attempt to desert. People should not dehumanize other people because their beliefs are different. A mother should not have to receive news that her son was killed in battle. It just doesn't make sense, and it shouldn't happen. How is this ever considered necessary and appropriate? While watching this drama, I was constantly left with a question: Why? Why, why, why? Over and over, I asked myself. How can this be happening? Why are they doing this? Why are they so blind to think that this kind of behavior is acceptable? Why is this considered normal? WHY? Why do these men and women have to die, especially in this way? If you got something completely different out of this drama, or it didn't move you as much as it did me, then that's alright. But an alteration of ideals is what I got out of it, which I'd say is pretty awesome, considering that the typical nature of the K-dramas' role is that of the escapist sort. Now I will step off of my soapbox, and talk about the drama itself. The characters, and their relationships to each other are the heart of this drama, and it definitely helps that they are well-written characters and that they are acted by capable (and some excellent) actors and actresses. Comrades has very little to do with ideologies, but rather, focuses on the experiences of ordinary people fighting in the war. And since it puts so much focus on the characters, I'm going to talk about each one, because they are so lovingly portrayed and written, and even if I didn't love all of them, I found them interesting and real. 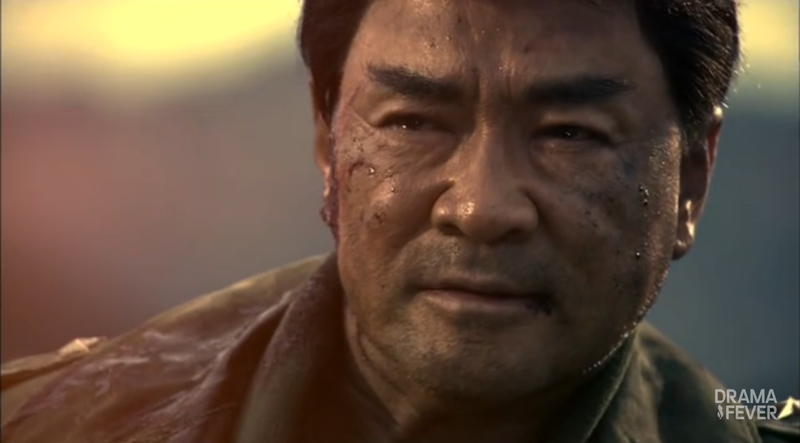 Sergeant Lee Hyun-joong (played by Choi Su-jong- who's pushing 50, and still looks ridiculously handsome...) is pretty much your typical jaded hero. He's been fighting long before the Korean War started and he's the longest fighting veteran in his squad. He's honorable and he loves his men dearly, and will do anything for them, despite the danger. 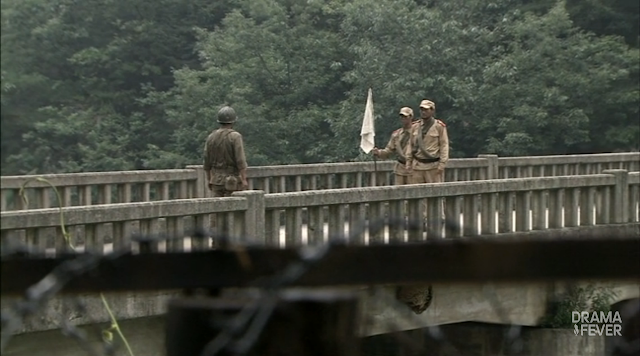 Choi Su-jong does an admirable job, and though the character is probably the most typical of the war genre, he gives the character a lot of sincerity. Park Il-kwon (played by Kim Roe-ha- who's quickly climbing my favorite Korean actors list) has a lot of demons. 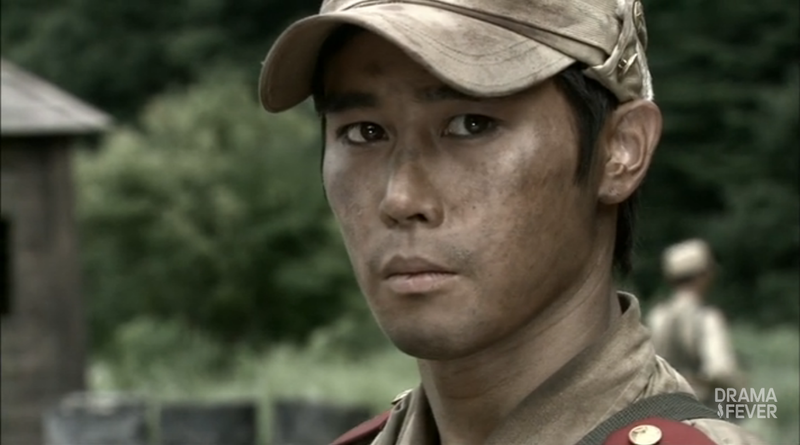 He was the only survivor of is original squad before eventually ending up under Sergeant Lee, and he's tough on his men because he wants them to survive. At the beginning, he was one of my least favorites, and by the end, he was my favorite by far. 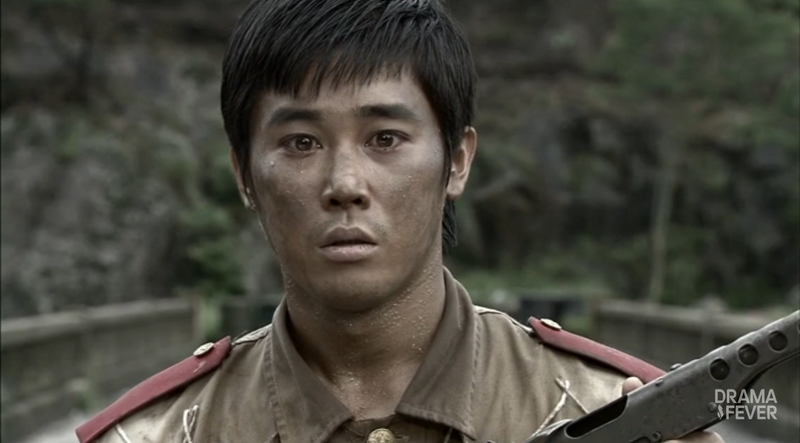 Kim Roe-ha has such expressive eyes, and when Park Il-kwon was forced to become the leader of the autonomous squad and later on, when he was accused of betraying both of his squads, my heart bled for him. Kim Joon-beom (played by Im Won-hee) is your typical squad clown. His good sense of humor managed to help out in a lot of situations, and I also appreciated that he had the most common sense when it came to securing his own safety... except that he cared too much for his comrades to abandon them in order to do so. 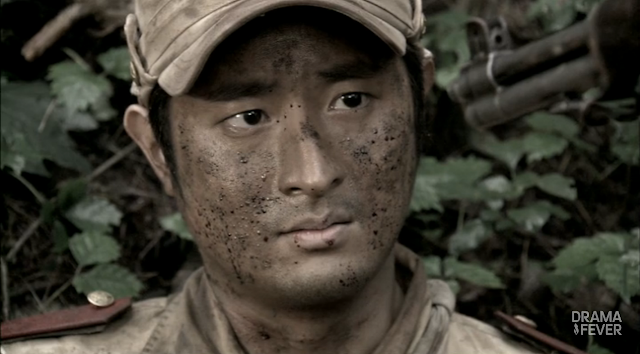 Park Joo-young (played by Ryu Sang-wook) is the angel of the squad. He dreams of being a priest, and clutches to his cross often enough. He's also doesn't kill, but is a medic and constantly attends to the wounded, no matter what uniform they wear. Maybe Joo-young didn't need too much developing as a character since it was pretty straightforward, but he's the only character that I felt dissatisfied with. Or maybe I'm just bitter that there weren't as many scenes with him, and therefore, I didn't get to look at Ryu Sang-wook as often.... I'll probably never know. Yang Sang-gil (played by Hong Kyung-in) had some interesting character developments, especially when he deserted to see his mother, and he (and everyone else) had to deal with the aftermath of his action. I liked his character because he wasn't too honorable and heroic, but he also gave his all, especially after his temporary desertion. On a weird side note, I love Hong Kyung-in's voice. Everyone else had a deeper timbre, but his is higher, especially his yelling, so it gave a nice contrast to everyone else's voices. Plus, I love that he's the shortest. Yeom Ha-jin (played by Nam Sung-jin) is the squad illiterate, but what a sweetheart he is. He didn't have to go into the army, but accidentally got in line (because he thought it was for something else) and signed up, and had to leave his newly wedded wife. The bromance between him and Sang-gil was adorable and I loved how much they depended on each other. One of my favorite scenes of the whole drama was when Ha-jin was being questioned, and the questioner wouldn't believe that he was illiterate and kept telling him to write down his testimony, and what does Ha-jin do? 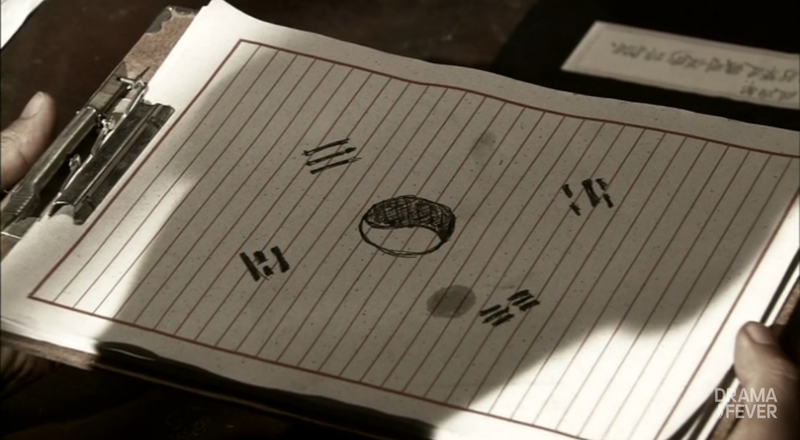 He draws the South Korean flag to prove his innocence and loyalty. 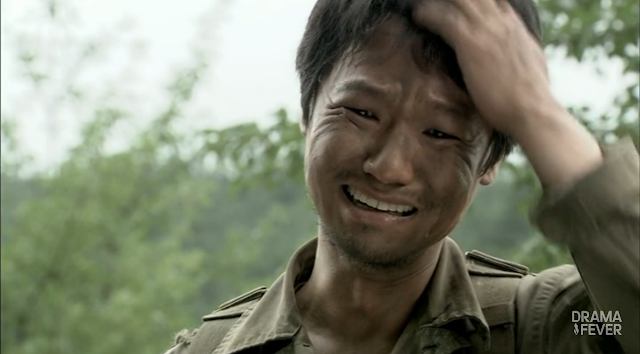 Jung Taek-su (played by Lee Seung-hyo- YAY!) is deeply devoted to his comrades, and is a pretty good guy, but also has nearly incontrollable urges to kill. It's decently disturbing, and the one reason I can't completely sympathize with him. His parents may have been killed by communists, but he slowly learns that not all of the enemy would do the same, and that many of them are sympathetic, and not truly his enemy. He's definitely one of the more interesting characters of the drama. Baek Seung-jin (played by Park Sang-wook) is the loyal guardian of the maknae in the squad, is a trumpet player, and towers over everyone else. I felt that he was a pretty flat character, though honorable and devoted, until he butted heads with Sergeant Park Il-kwon in the POW camp. On a wholly shallow note, Park Sang-wook gives the drama some much appreciated good looks. Kim Beom-woo (played by Ahn Young-joon) is the maknae of the squad at the tender age of 16 (and 17, later in the drama). He's an orphan and dreams of becoming a general one day, since that's really the only way that he can move up in the world. To say the least, he's adorable, and adds a much needed lightness to a very heavy drama. 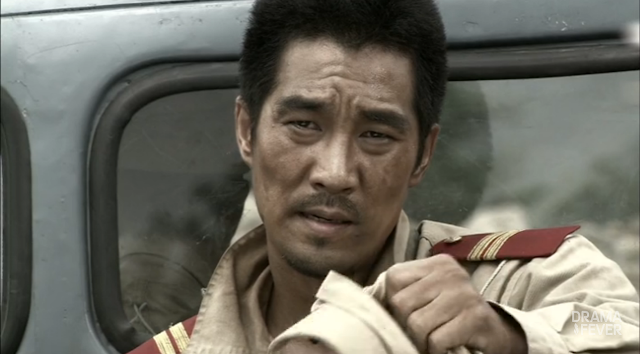 Chun Sung-il (played by Jung Tae-woo) used to fight in Sergeant Lee's squad... wait, except that he doesn't fight. Instead, he chooses to desert his post in middle of a battle, and ends up in the enemy's uniform to escape... except that he ends up getting caught by the enemy, and then must become a part of the enemy in order to survive. The reactions I've read to Sung-il's character have been all really negative, with them calling him a coward and such. I don't disagree that he's a coward in the beginning, but I do think there is a lot more to him than cowardice. Chun Sung-il isn't cut out for war, though I don't think that's a viable excuse for him not to fight, since I'd say that most people aren't. But I do think that he has a certain strength in that, no matter who threatens him to do so, Sung-il will not kill. When the fight on the bridge escalates to knives, I couldn't tell you how happy I was when Sung-il started shooting in the air, begging everyone to stop killing each other, because it's madness. No, I don't think Chun Sung-il was a coward, and in fact, I think he was smarter than anyone in not wanting to kill or be killed; however, I think he was wrong to think that he could get away with his mode of thinking. Because no else agreed with him, and no else really cared. 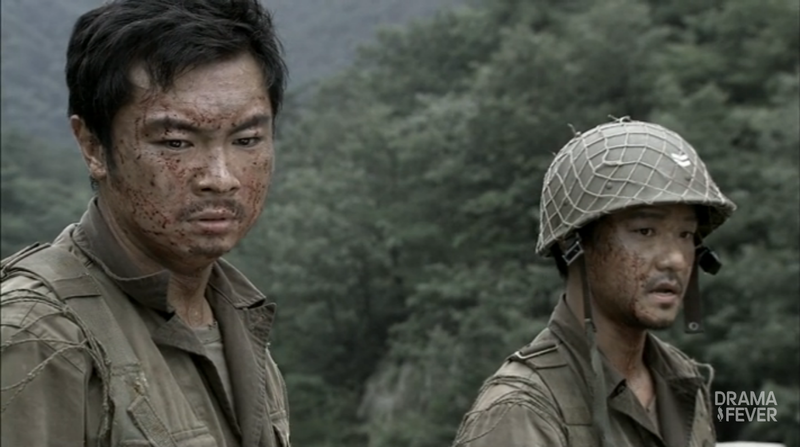 Chun Yong-tak (played by Kim Myung-soo) is the northern sergeant above Chun Sung-il, and the only person besides Sergeant Lee, who takes care of him. I think the few scenes with Chun Young-taek and Lee Hyun-joong talking to each other are so interesting because of how much alike they are. They are excellent sergeants and love their men, they both began fighting during the Japanese occupation of Korea, and they both love the same woman. However, they're fighting on different sides, and so the animosity between them is pretty palpable, even though it is obvious that both would rather not kill the other. I'm used to four kinds of women in war films/dramas: victims, by-standing love interests, mothers, and... no women. I pretty much prefer having no women to the others, but that's a personal preference. However, I loved having active, strong women in this drama. 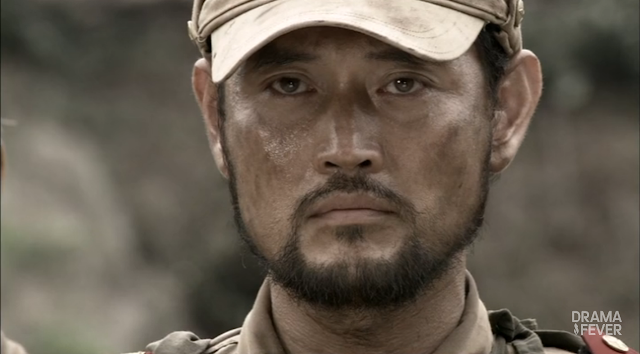 Lee Soo-kyung (played by Lee Tae-ran) is idealistic communist, and a good soldier. She also happens to be the one-true-love of Lee Hyun-joong. Initially, I was worried about there being a love story at all, but their love story is used well (and sparingly, for the most part). And no offense, but I really wanted her to die at some points in the drama. Well played, but I didn't love her stick-in-the-mud character. However, I did like that, in the end, her ideology just wasn't enough. The other women include a guerilla fighter, a sniper, another soldier, a nurse, a mother, Yeom Ha-jin's wife, and a lovely mother who lets a few of the southern soldiers stay with her even though her son is fighting with the northern army. All of them are strong, lovely women, and I appreciated their presence in Comrades. Oh, and for the record, THAT woman- yes, that EVIL woman with her tea, purple outfits, and love for opera- is a complete freak. That's all. I refuse to mention her character's name or to give her a screenshot, because every time I paused to take a screenshot of her, I just couldn't because I despised her so much. That all may sound really silly, especially considering that she is just a character, but I don't think I have ever felt so much hatred for a character. Ever. What a weak, selfish, pathetic excuse for a human being. As always, it's great to see Lee Duk-hwa in a drama, and I really loved his character, though he ended up playing a much smaller role than I originally thought. 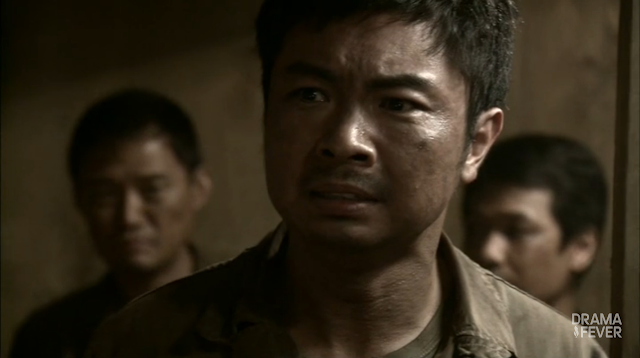 In particular, I found his last scene with Chun Sung-il moving/unsettling. I didn't like the main love story. I didn't dislike it, but I also didn't love it. It added some dramatic tension, but that's about it. Also, the two scenes or so of their past together were, by far, the cheesiest of the series. I also didn't like how important it was at the end, though, I must admit, her part in the final episodes was made more heart wrenching by the fact that she was Lee Hyun-joong's love. I didn't like how many coincidences there were, though they were used extremely well. Again, dramatic tension, to keep all the characters that we care about, from both sides, in the picture, and directly pitted against each other. It worked well, but that doesn't mean that I have to like it. I didn't like all that eyeliner. Period. 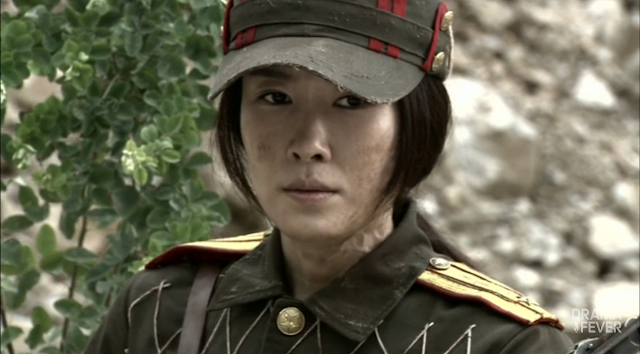 Besides that, though, the makeup was awesome in this drama, and very realistic looking. And there were a couple of scenes that had messy transitions that confused me and disrupted the narrative flow. It worked fine, and I guess could call them "artsy", but they weren't as smooth as the rest of the drama. Amazing as it is, that's all for my complaints. This is a great drama. Go watch it. Right now. Today, I was reading from a collection of short stories by Julio Cortázar (translated into English), and I found one line that I had underlined earlier particularly effective after watching Comrades. I love the title Comrades a lot better than the other title it is known by: Legend of the Patriots. Legend of the Patriots gives some grand vibe of great men doing honorable deeds in the name of country and all the connotations that come with that kind of thing. Comrades is fitting, because this drama is all about the brotherhood of man and the fight of a few men to keep themselves and their buddies in one piece. That's it. And that's what makes this drama so effective and beautiful and wonderful.